Learn the fundamentals of PPC and how to integrate it into your marketing. Marketers, can we be honest with each other for a second? On a scale of 1-10, how much do you really understand the world of paid advertising? Despite the fact that 45% of small businesses use paid ads, pay-per-click is still a concept that eludes many of us. But if half of small business are using it, we just can’t afford to ignore this channel, no matter how perplexing. As a marketer, PPC is a skill that you should have in your toolbelt — or at least have a basic understanding of. This guide will help you grasp pay-per-click marketing in its entirety. To start, we’ll begin with the benefits of paid advertising and then get into some key definitions that you’ll need to know. Pay-per-click, otherwise known as PPC, is a form of search engine marketing (SEM) where the advertiser pays for clicks on an ad. With PPC, you only pay when people interact with your ad — meaning you attract people who are interested in your offer. When done right, PPC can earn you quality leads. If you can create a seamless user journey (which you’ll learn how to do later in this piece), it could mean a huge ROI for your PPC efforts. Pay-per-click advertising is most common in search engine results pages (SERPs), like Google or Bing, but is also used on social channels (although CPM is more common). If you’re wondering where you can find pay-per-click ads, they’re the results you see before and to the right of the organic search results. For instance, check out the ad that came up in my search for “hair plugs”. So, why would you pay for ads when you can reach your audience organically through great content and strategically-placed keywords (otherwise known as SEO)? The answer is: keywords have become increasingly competitive. This makes it more difficult for a business that doesn’t have the domain authority to get them into the top rankings on a search engine or in front of their target audience on a social platform. In fact, so many businesses are using ads that organic results often don’t even start until you’re further down the page. That doesn’t mean you should ditch all SEO efforts completely — your paid advertising should complement your SEO strategy as opposed to replace it. Paid advertising will help you rise to the top in a competitive market and be seen by potential customers who may not know that you exist. It can help you promote your next marketing initiative, improve brand awareness, or rank for difficult keyword terms. In other words, PPC is your shortcut to getting to the top within your niche. And, if done responsibly, PPC can be integral to your inbound marketing strategy. PPC and CPC are not technically the same thing. PPC refers to a style of marketing that includes paying for advertisements. CPC, or cost-per-click, refers to the amount of money you spend on a single click on your ad. What’s a marketing channel without a few acronyms and a little jargon? If you’re going to enter the paid advertising space, there are a few terms you should know. Below, we review the main elements of a PPC campaign, ranging from broad to the more specific. The objective of all forms of digital advertising is to rank for a target keyword, and that can be done in a number of ways. Search Engine Marketing (SEM) refers to any digital marketing (paid or unpaid) done on a search engine, like Google, Yahoo or Bing. SEM is an umbrella term that encompasses both paid advertising and search engine optimization, that is, ranking organically for keywords. It’s important to note that not all PPC occurs on search engines — social media has PPC ads, too (think: Facebook Ads). This value determines the position of an ad on a search engine results page. It’s equal to Maximum Bid x Quality Score. This is the score that search engines give to your ad based on your clickthrough rate (CTR) — measured against the average CTR of ads in that position — the relevance of your keywords, the quality of your landing page, and your past performance on the SERP. This is the maximum you are willing to pay per click on you ad. You can set your CPC to manual, where you determine the maximum bid for your ads, or enhanced, which allows the search engines to adjust your bid based on your goals. One of these enhanced options involves bid strategies that automatically adjust your bids based on either clicks or conversions. CPM, also known as cost per thousand, is the cost per one thousand impressions. It’s most commonly used for paid social and display ads. There are other types of cost-pers… like cost-per-engagement, cost-per-acquisition (CPA), but for the sake of preserving your mental space, we’re going to stick with clicks, a.k.a. CPC. The first step in setting up your PPC ads is determining your ad campaign. You can think of your campaign as the key message, or theme, you want to get across with your advertisements. One size doesn’t fit all. That’s why you’ll create a series of ads within your campaign based on a set of highly related keywords. You can set a CPC for each ad group that you create. Each ad within your ad group will target a set of relevant keywords or key terms. These keywords tell search engines which terms or search queries you want your ad to be displayed alongside in SERPs. Once you determine which keywords perform best, you can set a micro CPC just for keywords within your ads. Your keywords should inform your ad text. Remember, your Quality Score is determined by how relevant your ad is, therefore, the text in your ad (and landing page for that matter) should match the keyword terms that you’re targeting. A landing page is a critical piece of your paid advertising strategy. The landing page is where users will end up once they click your PPC ad. Whether it’s a dedicated webpage, your homepage, or somewhere else, make sure to follow landing page best practices to maximize conversions. Now that you understand the PPC basics, I’m guessing your next question is: Where should I advertise? There are dozens of online spaces where you can spend your coveted ad money, and the best way to vet them is by taking a close look at your potential ROI on each platform. The most popular advertising platforms are effective because they’re easy to use, and, most importantly, highly trafficked. But for a smaller budget, you might consider a lesser-known alternative to these key players. Some additional things to consider when choosing a platform are the availability of keyword terms, where your target audience spends their time, and your advertising budget. Here a non-exhaustive list of some of the top PPC platforms. How many times a day do you hear the phrase “Let me Google that”? Probably more than you can count … hence why Google Ads is the king of paid advertising. The search engine receives 3.5 billion queries per day, giving you plenty of opportunities to target keywords that will get your intended audience to click. The downside is that keywords are highly competitive on this platform, meaning a greater ad spend. If you’re planning to use this popular platform, start with our free Google Ads PPC Kit. When it comes to advertising platforms, Bing comes in just after (albeit far behind) Google Ads with approximately 12 million queries per day. Yahoo! and Bing combined advertising forces, which expanded their audience reach. The perks of using Bing Ads over Google Ads is a slightly lower CPC at the expense of a larger audience, of course. Facebook Ads is a popular and effective platform for paid ads (more commonly used as CPM than CPC), mainly due to its specific targeting options. Facebook allows you to target users based on interests, demographics, location, and behaviors. Also, Facebook allows for native ads, which means ads are introduced and blend into the social feed. Not to mention, you can use Facebook Ads to advertise on Instagram as well. AdRoll is a retargeting platform that advertises to people who have already visited your website. For instance, say someone read your article on cheese making. You can retarget them on other sites that they visit with display ads that advertise your online cooking classes. While retargeting is possible with Google Ads, the benefit of using AdRoll is that it can display ads on Google and social media sites, which gives you more opportunities to capture clicks or impressions, depending on your goal. RevContent focuses specifically on promoting content through PPC. It has the same impact as a guest post, where your content is displayed on an external site, except it’s in the form of an ad. You still bid on keywords and your advertisement is displayed next to content that is relevant to those keywords. With this platform, you’ll reap the benefits of a low CPC and highly engaged traffic. Now that you understand the benefits of PPC, have your key terms, and know what platforms you can advertise on, let’s dive in to crafting a quality PPC campaign. You don’t need to tackle these items step-by-step, but you will need to work through each of them to ensure that you create an effective campaign. I know I wrote that you don’t need to do these things in order, but you should do this step first. Without parameters, you risk your ad being untargeted and ineffective. You want to put your ad campaigns into the context of your ultimate business goals. Consider how your paid campaigns will contribute to those goals. Then, think about what you want to accomplish with your ads — whether that be visits, sales, brand awareness, or other — and how much you’re willing to spend to accomplish that goal. Your campaign goals will give you something to show for your ad spend as long as you determine how you will measure those goals. Your goal metrics should not be confused with your campaign metrics, which we’ll discuss below. Let’s touch on some common PPC goals and how to measure them. Brand awareness is how familiar your target audience is with your company. It might be a good idea to look into display ads for this goal so you can supplement your copy with engaging imagery. You can measure brand awareness through social engagement, surveys, and direct traffic. Lead generation is the direct result of having a relevant and engaging landing page to follow your paid ad. 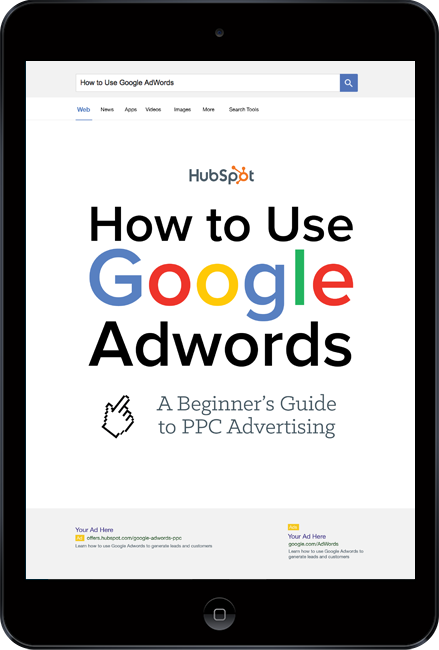 Since you will create a separate landing page for each ad group, you should be able to easily track lead conversions either in the Google Ads interface via a tracking pixel, or through UTM parameters, if you’re using a tool like HubSpot. Offer promotion is great if you’re running a limited time offer, product or service discount, or contest. You should create a dedicated sign-up page or a unique discount code so you know which users came from your ad. Sales can be measured by how much of your product or service is sold based on your paid ads. You should be able to track this through a quality a CMS software or attribution reporting. Site traffic is a great goal if you have high quality content throughout your website. If you’re going to spend money getting people to visit your site, you want to have some level of confidence that you can keep them there and eventually convert them into leads. You don’t only need to know where you’ll advertise but also how. There are many different types of paid advertising campaigns, and the one that you choose depends on where you can reach your audience. That isn’t to say that you can’t advertise through various means; you can also try a combination of campaign types as long as you’re consistently testing and revising. Search Ads are the most common type of PPC and refer to the text ads that show up on search engine results pages. Display Ads allow you to place ads (usually image-based) on external websites, including social. There are several ways to buy display ads, including Google Display Network (GDN) and other ad networks. Learn how to integrate Display Ads into your inbound marketing plan. Social refers to any ads that you see on social media, including Facebook, LinkedIn, Twitter, and Instagram. You can pay to show up in your target audience’s social feed or somewhere else within their profile, depending on the platform. Remarketing can use either cookies or a list of contacts that you upload to target people who have previously engaged with your company through some action. That action could be filling out a form, reading a blog, or simply visiting a page on your website. Google Shopping is most effective for ecommerce sites. Your ad — including image, price, and a short product description — will show on a carousel on a search page based on your target keywords. Each ad group you create needs to be assigned a set of keywords to target — that’s how search engines know when and where to display your ad. The general rule of thumb is to select between one to five keywords per ad group, and those keywords should be extremely relevant — your Quality Score depends on it. Select keywords that are closely aligned with the specific theme of your ad group. If you find keywords you want to target that fall outside of one theme, you should create a separate ad group for them. It’s important to note that you’re not stuck with the keywords you start with. In fact, you should closely monitor your keyword list throughout your campaign — eliminating those that don’t bring in the types visitors that you’re looking for and increasing your bids on those that do. Do your best to select the most relevant keywords, but don’t feel pressured to get it 100% right the first time around. If you’re new to keyword research, check out this handy guide. Google Analytics is free to use so there’s no reason why you shouldn’t install it on your website. The tool provides you with insights into how your website is performing, how users are interacting with your pages, and what content is attractive to visitors. The information you can gather from Google Analytics can be used for PPC and beyond. You didn’t think we’d let you spend your hard-earned money on advertisements without providing some best practices to follow, did you? Of course not. We want to make sure you succeed with your next PPC campaign. So, let’s get into some PPC strategy that will help you maximize your efforts and your budget. As a note, we’re going to dive specifically into paid search ads (those little guys you see in search engines) here. Bidding on targeted keywords will get your ad in front of the right people; good ad copy will get those people to click on your ad. Like your keywords, your ad needs to solve for intent of the searcher — you need to give the searcher exactly what they’re looking for and make sure that is clear through the words you use. Arguably the most important element of PPC (after your ad copy) is the page that you send leads to after they click on your ad. This page needs to be highly targeted, relevant to your ad, deliver what was promised, and present a seamless experience. Why? Because the point of your landing page is to convert your new visitor into a lead or customer. Not only that, but a high-converting landing page will improve your Quality Score, leading to better ad placements. There’s nothing that will diminish PPC profits like a poorly crafted landing page. Rarely will you as a marketer throw something out to your audience that works without testing. PPC campaigns are no different. A/B testing is as critical to your paid ad campaign as is every other element. The goal of testing your ad is to increase both your clickthrough rate and your conversion rate. The good news is that ads are comprised of just four parts that you’ll need to test: headline, description, landing page, and target keywords. Small tweaks to just one of these elements can significantly alter your results, so you want to make changes one at a time so you can keep track of where improvements come from. Since there are many variations that you could test one at a time, it’s a good idea to list out all the potential tests you can run and prioritize them by greatest impact. Finally, you should allow your ads to run long enough to gather the data you need and test them early enough so you don’t waste budget on a poor-performing ad. At a high level, maximizing ROI on your ad campaigns means considering customer lifetime value and customer acquisition costs, which will help you determine how much is worth spending on a new lead and how much of that spend can come from paid advertising. To get more granular, we need to talk inputs and outputs, that is 1) lowering your input (cost per lead [CPL]) and 2) increasing your return (revenue). There are a few factors to keep an eye on that will affect both, so let’s break it down. Determine an ad budget before you get started. Create more relevant ads. The more relevant, the lower your CPC. Improve your Quality Score. The higher your QS, the less search engines will charge your for clicks. Follow landing page best practices to increase conversion rates. Go after quality leads by being specific with your ad. The more quality your leads, the more likely they will convert and eventually become customers. There are a few other things you can do to maximize the ROI of your paid ads, whether it’s time spent, budget, clicks, or conversions. Google allows you to tailor your audience so you save marketing dollars and get in front of the right people. You can upload a customer list so that you don’t waste money on people who have already bought from you. Google also has options for prospecting audiences. For instance, In-Market Audiences employs user behavior tracking to put you in front of prospects who are in the market for a product or service like yours. You can also increase your bid for more relevant subgroups within your target audience — a practice called layering audiences. For example, HubSpot may layer on people who are in the market for CRM software and add a 30% bid adjustment because those people may be more likely to convert. Bid adjustments allow you to increase or decrease your bids based on performance. You can even make these adjustments based on different categories, like device, demographics, language, and more. For example, if a keyword isn’t performing as well on mobile as on desktop, you can add a negative bid adjustment so that when someone searches your keyword on mobile, you’ll bid X% lower than your normal bid. You can set up ad scheduling in Google Ads to display your ad only during specific days and times. This can cut down on ad spend and improve relevance for your target audience. Sitelink extensions allow you to supplement your ad with additional information. For instance, if you’re running an ad for a seasonal promotion at a local store, you can add a sitelink extension to display your store hours and location. These extensions take up more real estate on SERPs and, therefore, stand out. Not only that, but they play a role in improving your Ad Rank. Conversion tracking monitors how your landing page is performing via a tracking code that you place on the page where people land after completing your form (usually a “Thank You” page). By enabling this feature, you’ll be better equipped to make adjustments that can improve your conversions. Don’t let too much time pass before you check how your keywords are performing. You can place higher bids on the keywords that are creating the best results for your campaign, and “defund” or eliminate others. Match Types in Google Ads allows you to choose how closely related you want your ad group to be associated with a search team. There are four match types: broad, modified broad, phrase and exact match. Google will display your ad in results according to your selection. For example, if your keyword phrase is “how to catch geese” and you select “broad match,” then Google will display your ad for queries that include any word in your key phrase in any order … including “geese catch” and “geese catch how”. A negative keyword list tells search engines what you don’t want to rank for, which is equally as important as what you do. You might know some of these upfront, but likely you’ll determine these keywords by what isn’t performing so well within your campaign. Although CPM is more common on social platforms, social media sites do offer PPC that works similarly to search engine ads in that you set a budget and bid on ad placements. The difference is social media ads can show up directly in your news feed on most platforms, decreasing the effectiveness of ad blockers. Social platforms, like Facebook, let you set targeted demographics as well as target people based on interests. While paid search is more keyword-focused, paid social is broadens into a demographic focus, lending to more ways to target your persona. Social media has two paid ad functions that are critical to ad success — retargeting and Lookalike Audiences. Retargeting is remarketing to people based on site visits or manually uploaded contact lists. Lookalike Audiences reviews the people on your marketing list and creates an audience that parallels your list, which expands your potential target. Paid social also allows for a wider variety of ad types, like images, videos, text, and more. Paid advertising is not “set it and forget it.” You need to manage and constantly monitor your ads to ensure that you’re reaching optimal results. Management, analysis, and tracking is crucial to a PPC campaign, not only because they provide you with useful insights but also because they help you create a more effective campaign. PPC management covers a wide range of techniques, including creating and adjusting goals, split testing, introducing new keywords, optimizing conversion paths, and shifting plans to reach goals. Managing your PPC means looking at both strategy and spend. On one hand, it means iterating on your plan to optimize keyword effectiveness. On the other hand, it means thinking about how to allocate resources to certain keywords as well as how to adjust those resources to maximize ROI. A good management strategy also pays attention to providers — like search engines, social platforms, and ad networks — to monitor changes and updates that could affect paid campaigns. Overall, PPC management is a hefty undertaking, which is why investing in solid PPC management tools could be a great idea. Use our PPC management tool to monitor all of your paid campaigns. With all of the variables that you need to track, PPC management tools should make things easier. You can opt to monitor your ads within platform, but if you’re looking for additional assistance and organization, a robust, easy-to-read spreadsheet or sophisticated software that gives you insight into your ad performance is key. If you plan to go the software route, there are some features that you absolutely want to look for: multi-user support, cross-platform management, A/B testing, scheduling, reporting, and ad grading. Here’s a list of some popular, highly-rated PPC software and resources. WordStream automates the tedious parts of setting up and managing your PPC campaign. HubSpot offers a robust template to help you monitor and manage the moving parts of your campaign, making it easy to keep track of your ad groups, keywords, and A/B tests. NinjaCat lets you combine all of your analytics from multiple platforms into one report so you can track your entire campaign in one location. Optmyzr has end-to-end PPC support, from creation to reporting … and they offer a free trial of their software. SEMRush can help you manage the most important part of your PPC campaign — keywords. You can find relevant keywords, manage and optimize your keyword lists, and create negative lists. Metrics are everything (but you already knew that). Here are some key metrics to track within your PPC campaign. Clicks refers to the total number of clicks you receive on an ad. This metric is affected by your keyword selection and the relevance of your ad copy. Cost per click (CPC) measures the price you pay for each click on your ad. Clickthrough rate (CTR) is the the percentage of ad views that result in clicks. This metric determines how much you pay (CPC). CTR benchmarks vary by industry. Impressions is the number of times an ad is viewed. Cost per mille (CPM) is determined for every thousand impressions. Impressions are most relevant for brand awareness campaigns. Ad spend is the amount you are spending on your ads. You can optimize this by improving your Quality Score. Return on ad spend (ROAS) is the ROI of your ad campaign. This metric calculates the revenue received for every dollar spent on ads. Conversion rate refers to the percentage of people that complete the call-to-action on your landing page and become a lead or customer. Cost per conversion refers to the cost to generate a lead. This is calculated as the total cost of an ad divided by the number of conversions. Quality Score (QS) determines ad positioning, so it’s an important metric to keep an eye on. By paying close attention to each of these metrics, you can increase the ROI of your paid campaign and spend less for better results. Paid advertising is an effective tool that should be a part of your inbound marketing strategy no matter how long you’ve been in business. PPC just might be the boost you need to get an edge on your competition — or at least ahead of them in the SERPs.